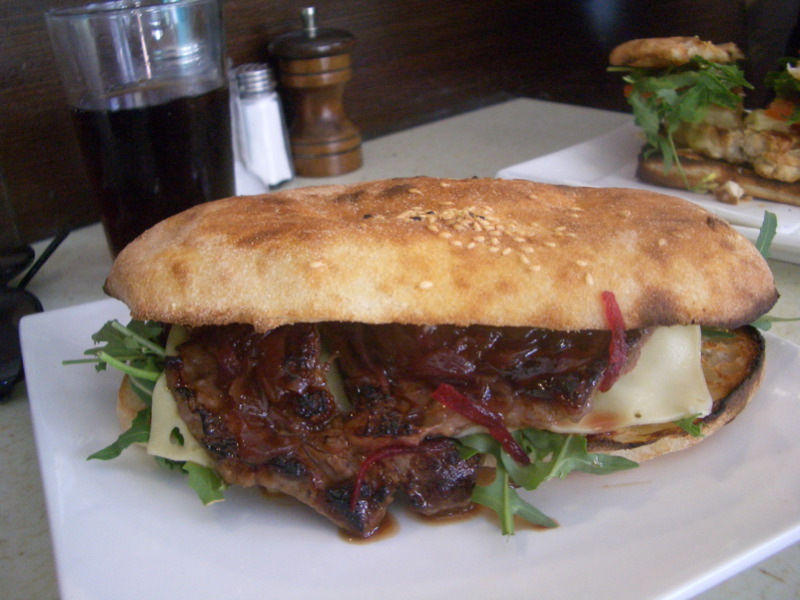 melbourne gastronome: Sangas at lb. I'll admit it - I pretty much can't stand the South Yarra end of Chapel Street. During the French Film Festival, best-friend-K and I were seeing two films at the Como on the same day (the trashy-yet-sorta-enjoyable U.V., and the much better Un Secret), so we had four hours to kill between films. B-f-K and I invariably end up cranky if we spend too much time up the South Yarra end of Chapel Street, because we both dislike just about everything about it: the "classy" fashion boutiques, the stereotypes (the snooty society matrons AND the hot-headed wankers in big sunglasses and souped-up cars) and almost all of the restaurants - which is often a problem when we're looking for a bite to eat before or after a film at the Como. So thank God for "lb." (aka Pound), a cafe near the Jam Factory but just off the beaten track, with a slick interior, excellent food and busy but friendly staff. If only it were open in the evenings too! 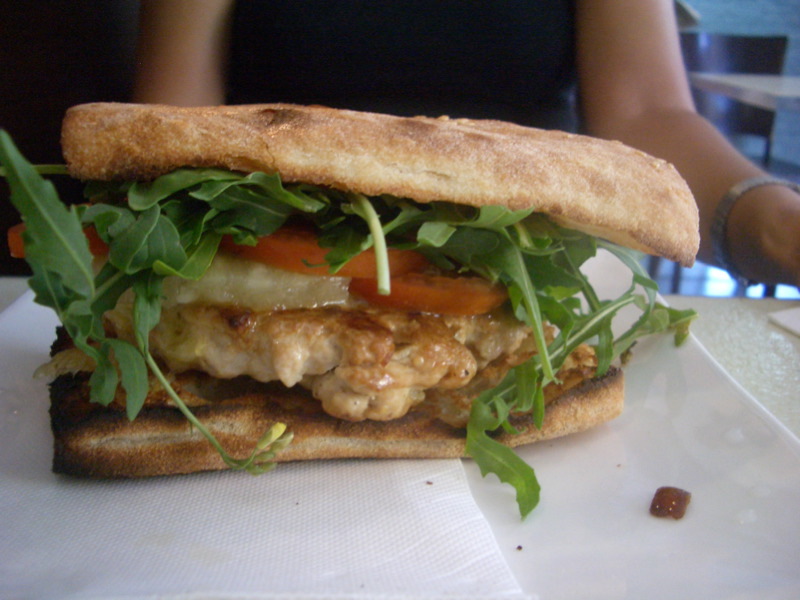 Kate had the Chicken Summer Burger for $12, which matched the chicken with tomato, cheese, pineapple, sweet chilli and rocket. I'm not a fan of pineapple in savoury dishes (with the exception of certain Thai curries), but b-f-K assured me that her burger tasted great. 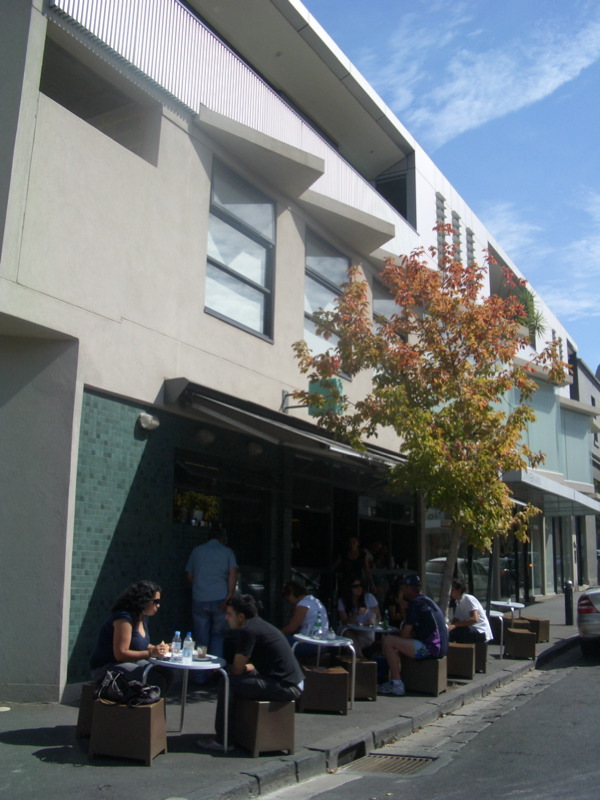 Am I being too harsh on the South Yarra end of Chapel Street? 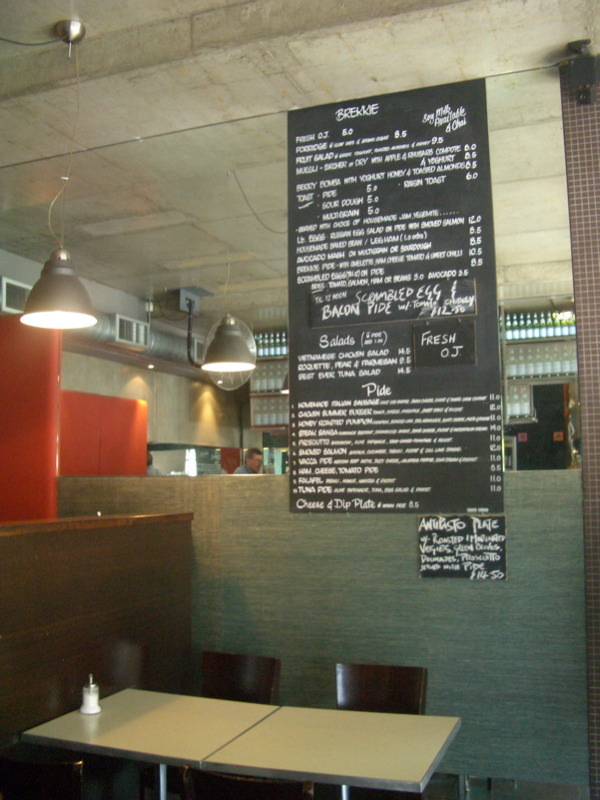 What Chapel Street restaurants in your opinion serve good quality food at a good price? Labels: *Suburb: South Yarra, Lb. Ooh, looks delish! I love a good steak sanga - it's disappointing when you get one that's not up to scratch. I'm not a fan of that end of Chapel st either - (apart from the KFC, haha). I usually wonder up past Commercial road, down the Windsor end. Hi Claire, I do like the yum cha tea house (can't remember what it's called) at the South Yarra end of Chapel Street - it's got great food and is not too pricey. I much prefer the Windsor end - a lot more funkier places, more relaxed vibe. Gotta love the churros at Basque! I have heard Pound do a great brunch, have you tried that yet? The other night I tried making a steak sandwich following a Bill Granger recipe from Sydney Food - it was amazing!!!! I was surprised by how good it was! Anyway, if you get a chance I think you should definitely give it a try! Just asking a question about your blog on Flavours of Lakhoum: who/what are the richmond mafia members?! Hi Sarah: yeah, I much prefer the other end of Chapel, but when I'm seeing a film at the Como (as I often do, I live just over the river in Cremorne, so it's my closest cinema) I often don't have time to go that far south - hence my frustration! Hi Cakelaw - I'm guessing you're referring to the AY Oriental Tea House? I've been to their city restaurant (see my review!) but haven't been to their Chapel St location except to buy some oolong tea. D'you know whether they're open for dinner?